A great Girl Scout tradition, a SWAP is a little remembrance that one Scout gives to another. They are handmade – giving a part of you to show friendship. They can have a tag attached with the name of Camp and date. SWAPS are small, inexpensive, easily made trinkets that can be pinned on a hat, shirt, etc. SWAPs can reflect the Camp Theme or the camper’s own imagination. •Make them as simple and inexpensive as possible. •Make something that will stay attached to a small safety pin. •SWAPs are often bounced around a lot, so make them durable! •Glue guns often speed up the process, but should be handled by adults. •The more you have, the more you can trade! Campers usually bring 30 to 50 Swaps. •Insect type creatures: Made from shaped pipe cleaners (plain, colored or fuzzy). •Small wooden cutout shapes painted, glittered or colored with markers. •Mini pinecones, flowers or leaves decorated with yarn, ribbon, beads, etc. •Mini felt bedrolls, sit-upons, knapsacks or campfires. •Beads strung on yarn, pins or pipe cleaners. •Pompoms made into imaginative creatures. •Puff painted felt or stiff fabric. •Stenciled tag board, clothespin people. •Large buttons or personalized wooden beads. REMINDER: SWAPS come to camp on Friday. Each camper should bring between 30 and 50 swaps. 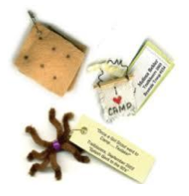 Materials will be available at the camp for campers who might forget their SWAPS on Friday. If you have any questions, please ask your camper’s Unit Leader.